Along with many others, I’ve banged on for a long time about the inherent problems of ‘dual provision’ – the idea that you can provide two different types of cycle provision, in parallel, for different types of users. Typically this might involve a shared use footway for ‘less confident cyclists’, alongside some half-hearted measures on the carriageway like advanced stop lines and narrow painted cycle lanes. The shared use footway might provide some more comfort, but at the expense of convenience and directness, while the painted stuff on the road is direct, but at the expense of comfort and safety. They both fail, but in different ways. Neither are suitable for all users; both are flawed. By contrast, high-quality cycling infrastructure should have uniformity of provision. It should be uniformly suitable for any potential users – convenience should not be traded off against safety; directness should not be traded off against comfort, and so on. All parts of a cycle network should reach a high standard of comfort, safety, directness and attractiveness. If parts of it don’t match a high standard for all of these criteria, then it’s not good enough. An example of uniformity of provision, that we are happily starting to see in the UK. This is suitable for everyone; the fast, the slow, the confident, the nervous. So I’m a little bit troubled by this recent piece on the Sustrans blog, by Will Haynes, principally because it argues that we should set out to expect compromise, and to trade off requirements against one another. I’ve quoted the relevant part below. … I would like to suggest that the reality of most situations means that there is rarely a perfect solution that can be lifted from the design guidance. At Sustrans we consider the key is the way in which designs are arrived at. Our Handbook for Cycle-friendly design and accompanying design manual recommends 10 top tips that designers should follow. One of these relates to the adherence to the widely quoted Five Core Principles (Coherence, Directness, Safety, Comfort and Attractiveness). However, how the principles are actually implemented is often relatively subjective and in many cases may conflict. 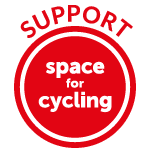 One way to objectively consider the principles is to use a level of service or route audit tool, such as the Cycling Level of Service assessment tool in the London Cycling Design Standards and Cycle Route Audit tool in the Active Travel (Wales) Act 2013 Design Guidance. In most cases different route options within a corridor, or different types of provision for a particular route, will have a number of advantages and disadvantages. By applying these tools it is possible to compare different options for a particular route, or to compare different options for a corridor and have meaningful information on which to make a decision as to which is the best solution. For example a traffic free greenway is likely to provide a high level of safety in terms of being segregated from motor traffic, but is likely to be less advantageous in terms of personal safety at night and directness. Alternatively, a high quality segregated cycle track may provide good levels of safety and directness but by increasing severance for pedestrians wanting to cross a route it may not contribute to an attractive provision where a high place function is desired. In summary designing good places to cycle is more than just implementing standard solutions, no matter how high quality they are. I don’t think this stands up to much scrutiny, to be honest. Nobody is saying a cycle route has to be absolutely perfect. However, the impression given here is that compromise is inevitable, and that delivering a route from A to B will necessarily involve sacrificing one of the key requirements. For one thing, the audit tools mentioned here shouldn’t be used to choose the least worst option – as implied – but instead should be used to identify failings, to remedy them, and to ensure that what is being built meets the highest possible standard. Nor should the route that is built necessarily sacrifice on one or more of the requirements for high-quality infrastructure. The examples given are unconvincing. Why should greenways through parks be indirect or socially unsafe? Make them direct. Make them feel safe, with street lighting, and activity. Routes through parks can and should be direct, and should also feel safe. Likewise, why should cycleways on main roads be unattractive, or contribute to ‘severance for pedestrians’? They are necessary on main roads, and they should be built to a good standard, in keeping with their surroundings, and easy for pedestrians to cross. Cycleways don’t have to be unattractive, or hard to cross. Just build them properly. I simply don’t recognise these kinds of trade-offs when I cycle around the Netherlands, be it in towns, cities, villages or in the countryside. The routes I use feel safe; they are direct; they are comfortable, and they are attractive. Where they are not, there is an obvious problem that needs remedying, and that almost certainly will be remedied when the route or the road comes up for review. The problems are not ones without a solution. Of course, it’s harder to do things properly. Ensuring that cycle routes are direct, and that they feel safe, comfortable and attractive, requires political commitment, particularly when it comes to reallocating road space, or reducing the amount of motor traffic travelling on residential streets, through physical interventions. But these are problems of political will, not insurmountable problems inherent with delivering cycling infrastructure itself. (It’s no surprise that the highest quality infrastructure in cities like London has required the most coherent and sustained campaign to persuade those in power to deliver it). By contrast, it takes next to no effort at all to deliver rubbish, be it an alleged ‘cycle route’ that disappears off onto indirect and socially unsafe backstreets and alleyways, or shared use footways, or painted rubbish, on main roads because protected cycleways are just too difficult. Indeed, for that reason, it’s actually quite dangerous to suggest that cycling infrastructure can’t be done to a high standard, because it provides politicians, planners and highway engineers with a ready-made excuse for doing a poor job. That’s not what I want to see at a time when cities in the UK are – in a number of places, and in piecemeal fashion – actually starting to deliver infrastructure that doesn’t compromise. Even this provision “could do better”. Sure, it could be better, but it doesn’t involve any of the trade-offs that are mentioned in this article. It is direct, safe, comfortable and attractive. Given that it is four metres wide, and there is clear visual and height distinction between it and the (wide!) adjacent footway, I’m not at all certain the problems you mention will actually materialise. Fair enough, only time will tell. It’s definitely better than the (lack of) alternatives. In the Netherlands (and Denmark/Japan/Germany etc) the highways – which include the on-road bike paths – are full of “slow, confident” riders. Doesn’t seem to be a significant category in the UK yet – and we need to ask why not – perhaps, as Mark T implies, it’s because the infrastructure design has historically pretty much guaranteed this won’t happen (yesterday, NCN4 in N Surrey was enough of a quagmire to deter most walkers, never mind riders). I do see plenty of “fast, nervous” riders though – which is kind of what you’d expect. Excellent post, and I agree with it entirely. I think the problem is not dual provision per se but crap provision, whether it be uniform, dual or multiple. Meandering paths through parks are positively enjoyed by many but are useless for those who want to get to work in a hurry. Both have their use, but different and not always compatible uses. I remember being at a presentation given by Dutch traffic expert Ineke Spapé where she said much the same thing: that people often follow a main road in the morning and take a more leisurely, greener route home. I pricked up my ears and started wondering if dual provision was a “thing” in the Netherlands, too. Of course both routes would have to be of acceptable quality, but one might be quicker and the other can be scenic. That was in the context of network planning using “ladders” to build in extra robustness and redundancy and give people plenty of options, though, not the sort of British/Irish dual provision where both inadequate options are essentially built right next to one another in the same place. Dual provision shouldn’t be used to justify shoddy compromises, but cyclists do have different needs at different times and even high-quality provision is unlikely to suit all of the people all of the time. Some things can’t be designed out in the next review because they are beneficial and problematic at the same time. Shade provided by trees and hedges can be a life-saver on a sunny afternoon, but feel quite scary after dark (harder to see birds or animals about to burst out onto the path, harder to identify hazards like fallen branches or patches of ice). This is especially the case for downhill cyclists – if I’m travelling downhill in the dark at 30-40 km/h, I don’t want to hit so much as an apple unexpectedly. I don’t think that is dual provision, at least not in the sense Mark was referring to. You don’t need to be more confident to take the the direct route, you probably could still ride fast on the meandering route, they are not parallel. So the same people use them it is down to choice. Utility routes vs recreation routes maybe, but not the dual provision being referered to in the main post. I think a good test here is: when the two types of provision come together for a bit, can they be merged or do they need to be parallel? The Dutch cyclist of the type you mention would not mind taking a bit of ‘fast’ infrastructure to go from one park to the other in the ‘slow’ mode, and if a ‘fast’ cyclepath has to cross a ‘slow’ area, the path might have to be widened, but otherwise it can be used without any change. In the given ‘bad’ example on the other hand, the two provisions are next to each other on the same road. They obviously cannot be merged, otherwise, why not do so? I’m not sure what that’s meant to be a good test of: differentness? shoddiness? It’s not clearly a test of anything other than whether two paths can be merged, so a bit of explanation would be helpful. What I meant was: A good test on whether the ‘dual provision’ is good or bad. Ok, thanks. So you mean good provision might have separate ‘meandering’ and ‘direct’ routes but merge – without causing ‘fast’ riders to slow down or ‘slow’ ones to be intimidated (by anything) – at certain points. As opposed to making the fast ones wobble along a pavement or the less confident ones cower in the gutter of a dual carriageway! Yes, seems a fair test. I am aware of a current project being worked on by Sustrans, TfL and borough for design of a superhighway in London. For a section of the route, rather than using the main road, it looks like they will be proposing a route along a parallel road that will be a “Quietway”, that is, not segregated. The main road has better access to a large office park, but it is only a couple of hundred metres from the parallel route, therefore not a major detour, so I don’t really see many major disbenefits from the Quietway as a route. I think a segregated route along the main road and across a major junction would cost an awful lot of money. Making the “Quietway” quiet would cost a “No Entry Motor Vehicles Sign”. However I think people are right to be cynical about the political will to do things properly. As you say the Quietway has to be kept quiet – a narrow road with a lot of traffic is worse than a wide one. The other important requirement is connection to the next part of the route. The most important issue, surely, is that those backstreets should not be “socially unsafe”. That needs to be dealt with for the sake of the residents and everyone else, regardless of whether a cycle route goes there. Yes, but. I sometimes cycle around the area bordering Lewisham and Catford, and there are many of these kind of routes, both on streets and in parks, where social safety feels very compromised. The streets are not residential, but industrial, and although lit there is a feeling of solitude and separation from the urban nest of populated places. The parks are especially poor at night, in that they are linear parks through industrial areas; not pleasant at the best of times but in the dead of night even as a confident, able-bodied male I find them somewhat intimidating. The one thing I’m certain of is that I’d not feel this sense of separation on the high street, which I believe would lead to a better sense of perceived safety. Engaged at the moment with a Quietway consultation with precisely this dilemma. A route from Wansworth Common to Bushy Park goes down Ham Gate Avenue. The road is usually half blocked by parked cars and there is a shared use footpath used by lots of dog-walkers. Obviously you can’t cycle fast on the footway and using the road requires dealing with oncoming traffic – not usually too aggressive here but not ideal for the less confident. So dual provision. b) Tarmacking Ham Common is politically unacceptable ; as most cyclists would agree. From a quick look at the area using street view, I have to ask why cars need to be driving along that road at all? I can understand the need to park a car to access the Richmond Park, but could not the safety problem be solved by traffic calming and closing these roads to through motor traffic, thereby reducing the traffic to levels where the current road becomes a safe cycle route? Exactly he sort of reasons why sustrans universally build complete rubbish. I recently used a very wide on-pavement cycle track in Tottenham and had to keep my speed right down because of pedestrians “wandering” over the track. I also walked in Berlin and found the on pavement provision there a bit frightening. What is good practice to segregate these on-pavement routes without making them too difficult to cross? Preferably a height difference of 50mm or so via a chamfered kerb (i.e. 45 degree slope, not vertical) a smooth tarmac surface for the cycle route and paved for the pedestrian area, and if it’s bidirectional a white painted dashed line to give a strong visual cue to the pedestrian that the area is primarily for cycling on. Consistent use of colour for the cycling route (e.g. red tarmac) also helps. This is exactly the problem with Sustrans, why much of what they deliver is poor and probably explains why they seem to take a back seat when it comes to real campaigning compared to LCC and the numerous well-researched and well-written blogs. If you come to the table ready to accept a (large) compromise then you’ve set yourself up for failure. A great example of dual provision is CS8 on Grosvenor Rd right next to Chelsea Bridge. Take your pick between the mandatory cycle lane or the thin strip of Sustrans “Thames Cycle Route” on the pavement: https://goo.gl/maps/59xeijgiZ6U2. Not sure I’ve ever seen anybody using the pavement here.